Chest tube inserted first, and then VATS done. First chest xray showed my right lung had collapsed to a size of about 10 to 20% of the original size. 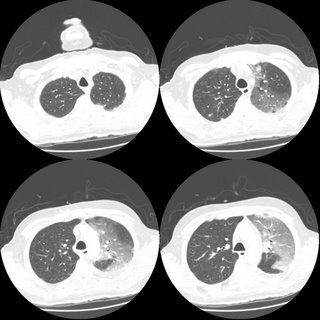 Subsequent X-rays after the VATS showed that my lung had re-expanded to 90% of its original size. 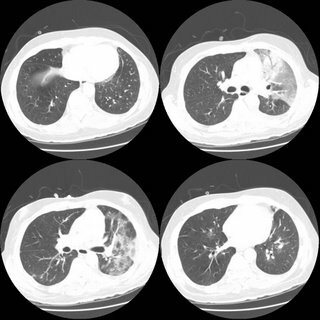 The surgeons warned of a 10% chance of recurrence or occurrence in the other lung. My question is, I am passionate about flying, and already secured a place in the undergraduate program in Bachelor of Science (Aviation) in Perth's Edith Cowan University, which includes Commercial Pilot's License. They are waiting for my acceptance. Do I still have the medical conditions and requirements to fly? I am an 49 year old female with extended family history of severe asthma, allergies, some CF. I have diagnosis of common variable immune deficency, severe asthma, bronchiectasis, 10 sinus surgeries, 5 on the frontal alone...all to clean out polyps. Have malabsorption and arthritis. I have been on oral Prendisone for 10 years along with many other breathing medications. 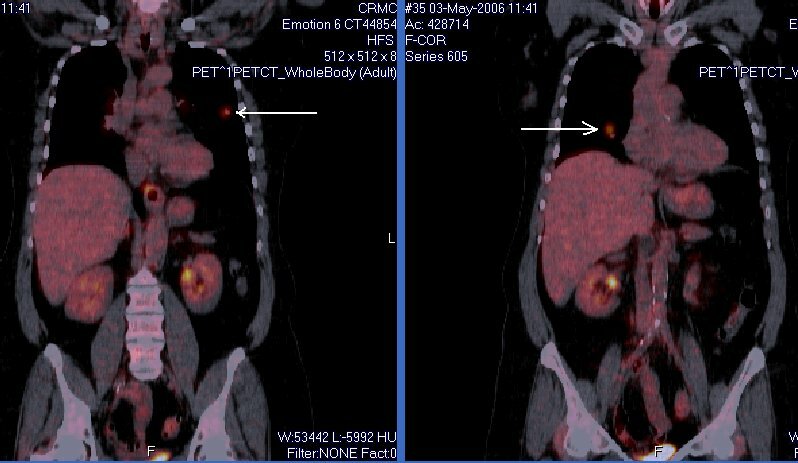 Do long term steroids (Prednisone) affect swest tests? My sweat test is negative, dna analysis only shows 1 CF gene. Does anyone care to share any info about if long term Prednisone can affect sweat tests? This 83 y/o man with no COPD, no TOB Hx was referred to us by his PCP for 2-3 days of cough and low-grade fevers at home. He had had a cold the week before with some rhinorrhea and then developed low-grade fevers (~100) at home with scant purulent sputum and dyspnea as well as malaise. No night sweats, chills, weight loss or hemoptysis. His exam was only remarkable for B/L ronchi, worse on the right. 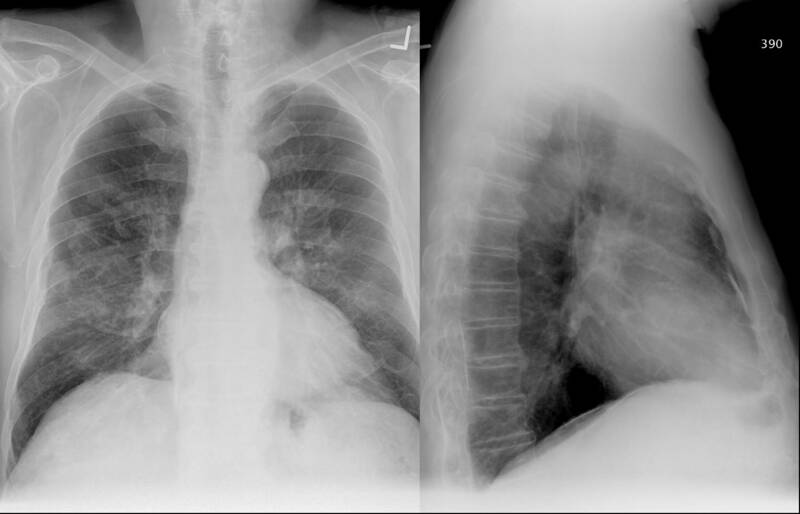 On admission, he had the fairly benign CxR above; WBC ~9K with a left shift and no other biochemical abnormalities. 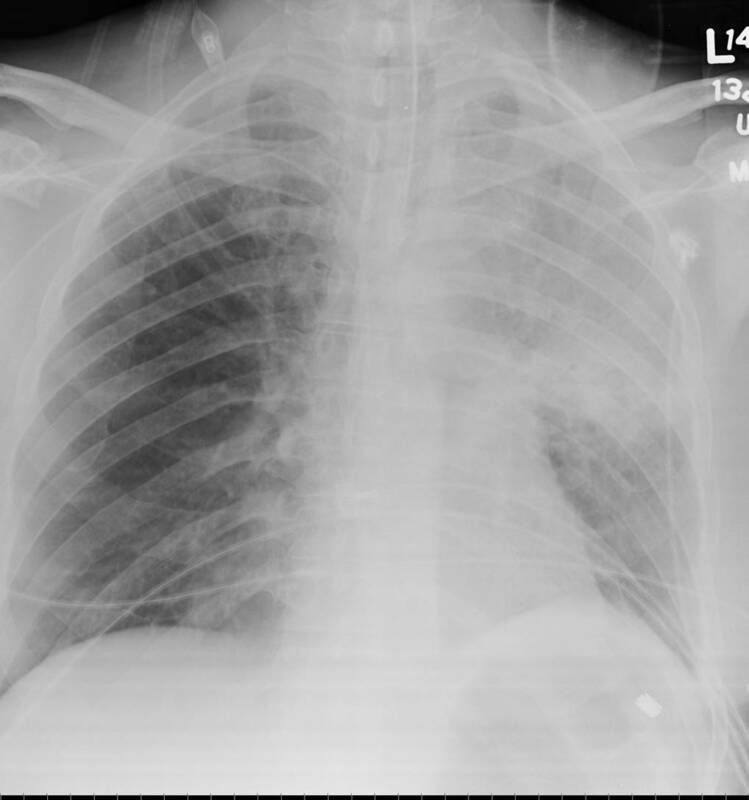 He had minimal hypoxemia and was started on ABTx for a purulent tracheobronchitis with dyspnea in an 83 y/o patient. He had a great clinical response within the first 24 hours and was D/C'ed home off O2 in 2 days. His sputum smears were non-contributory but 2 weeks later I got a call from our lab that he was growing AFB in his sputum Cx. Would you assume it is TB or would you favor a non-TB mycobacteria? Clinically he was doing great at this time and had finished his ABTx (doxycycline). What would you do next? [...]did not improve after 3 separate antibiotic courses, one of which was amoxicillin and the other was placebo. What is causing this RUL process? 54 year old man with AML s/p allogenic bone marrow transplant april 2005 on immunosupp therapy for GVHD of the skin. He is CMV negative by UltraQuant less than 200. 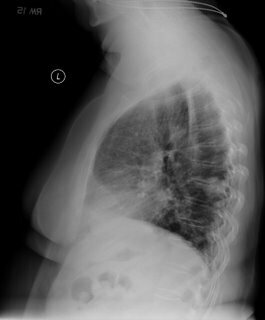 He was admitted for shortness of breath and has a RUL infiltrate which you can see below. He was transferred to the ICU because of hypoxemic respiratory failure. In the ICU, his antibitic coverage was broadened to include tobra/vanco/zosyn/voraconazole and PCP-dose IV bactrim. A BAL showed 250 WBC's with 70% PMNs, but no growth and the gram stain was also negative. ID consult want an open lung biopsy, but when pressed for what they were looking for were unable to give a specifi entity. What are your thoughts and what would you do next? This 76 year old man has IPF documented on a 2004 open lung with typical CT findings as well. In 2004 his FVC was 47% predicted with a DLCO of 31% on 6l. It is severe, but he has been stable over a 2 year period. He did have a trial of steroids back then with no effect (no surprise. He was doing well until a month ago when he developed a "cold" (increased cough with whitish sputum, runny nose/nasal congestion). He continues to have profound DOE. No fevers or chills. 3 separate antibiotic course were without effect. He is SOB even with urination. On exam he can speak in full sentences and is in no acute distress at rest. His sat is 93% on 4l NC. 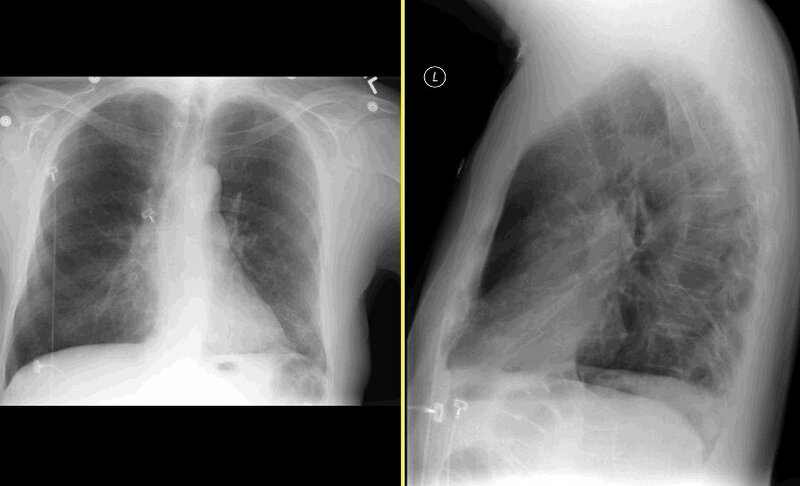 His lungs show no change in his fine bibasilar crackles 1/2 up. JVP about 5-6 cm. No LE swelling. A spiro showed no chnage in mechanics compared to 3 months ago (before the "cold"); FVC 48% pred, but DLCO now is worse at 23% predicted (31% in 2004 the last time it was checked). However, the IVC was only 38% of predicted. On exam his sat is 93% on 4l at rest. His CXR is unchanged from a year ago and is shown here. 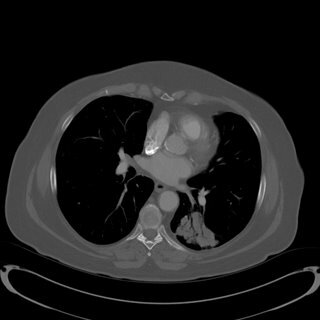 What are your thoughts as to the cause of his new dyspnea? What else would you do? I just saw him today so there is no "magic" answer that I am witholding; just looking for other opinions (you know, like a roundtable discussion). fev1/fvc% 80, tlc-59%, RV 3%. I wheeze constantly, and wonder if anyone has any ideas before I see my doctor friday. 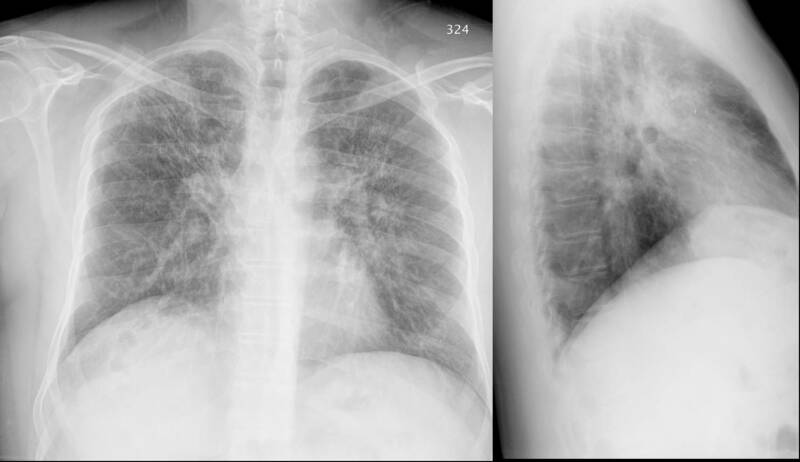 I saw this 50 y/o man with a label of remote asthma who had quit smoking in 1980 for cough, wheezing and dyspnea. He gave a good Hx for asthma and had an FEV1 of 58% with FVC: 65%, normal TLC and normal DLCO. I started treatment and a few months later on ICS his FEV1 had come up to 69% but he still had a significant cough. In searching for triggers (e.g. GERD) and other conditions (e.g. ABPA) I found an IgE level of 927 (upper limit 158). Since he was still wheezing I gave him some prednisone and continued the ICS. His FEV1 is now 73% and he feels better. His IgE is now 655. Would you bother following the IgE at all? Since he still has a persistent (mild) defect, would you give him any more systemic steroids? Have you had a good experience with Xolair? This 72 year old man is asymptomatic and had a routine chest xray as part of a yearly exam from his primary care physician. Our goal here is not to turn the blog into a journal club, but I think this has important implications on both practice and liability. Am I the only one who thinks that while the "relative" risk is increased, the "absolute" increased risk is amazingly small. 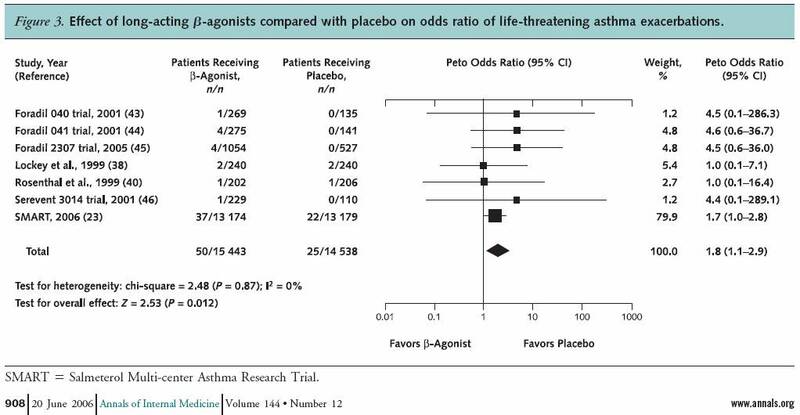 I'm not sure that the increased "risk" outweighs the benefits of LABA's in patients with moderate or severe persistent asthma, or in patients with COPD who remain symptomatic despite anticholinergics. One of my patients is a 55 y/o woman, heterozygous for A1AT with very low serum levels of A1AT (~65-75). Unfortunately she has continued to smoke and her FEV1 is 30% of her predicted with hyperinflation and decreased DLCO. She asked about "re-checking" her serum levels and whether she would be a good candidate for augmentation therapy. I have been less than excited with the ongoing smoking and pretty advanced COPD. I would be more interested in evaluation for a possible lung Txp in the future if she ever quit smoking. Her most recent serum level was 72. Would you consider A1AT replacement? 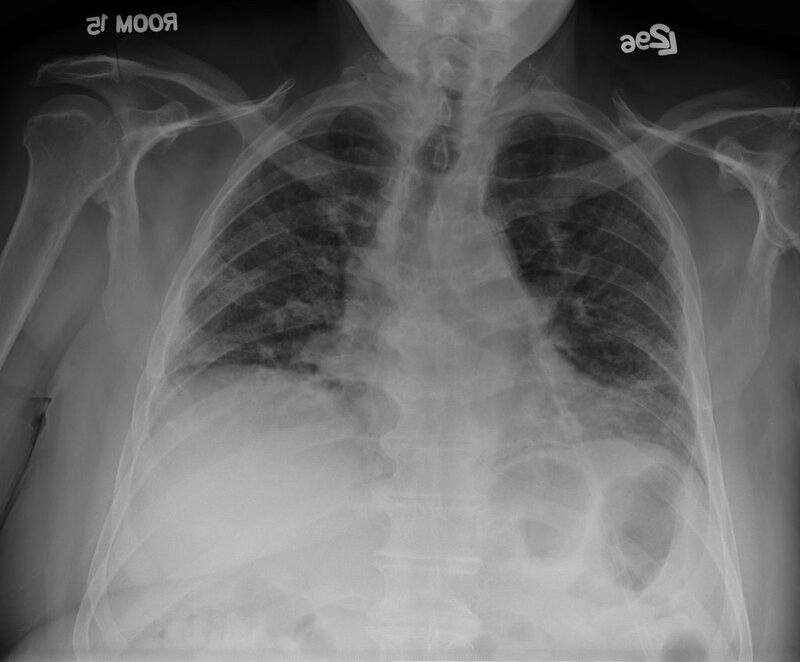 A 59 year old caucasian man is referred for cough and dyspnea. He carries a diagnosis of sarcoidosis at least back to 1999 but has never had a biopsy. Let's assume the spiro is a restrictive pattern. Based on the following chest xray, would you do anything else to more definitively confirm the diagnosis or would you be satisfied as it is? Just curious what you all think of the role of stenting in advanced lung cancer. This obviously would not effect such hard endpoins as survival, but it seems to alleviate dyspnea and might mpact on quality of life. Unfortunately I do not think there is much data out there to support this, but this does not necessarily mean that these endpoints are not impacted. Until there is data, what are you all doing with advanced lung ca with regards to interventional bronchoscopy? "My husband had a CT-scan and an enlarged mediastinal node (1.5 cm.) was noted in the short axis adjacent to the descending thoracic aorta. At the time, he had suffered an episode of pain and shortness of breath, and was diagnosed with pleurisy. 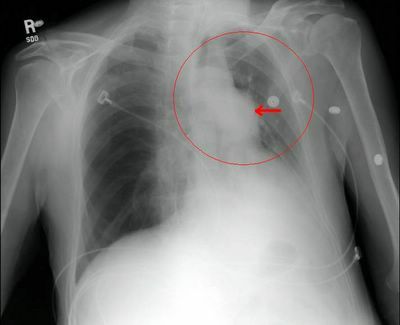 One month later, a repeat CT scan showed that the mediastinal node was still enlarged, though had not increased in size. What is the normal protocal for monitoring this condition?" Jennings posted a controversial question on secondary erythrocytosis, he still has the case of the woman with a persistent infiltrate and a discussion on small-fiber neuropathy and fatigue in sarcoidosis. Leave your comments and impressions. Remember, you don't need to log-in if you prefer to leave an anonymous comment. 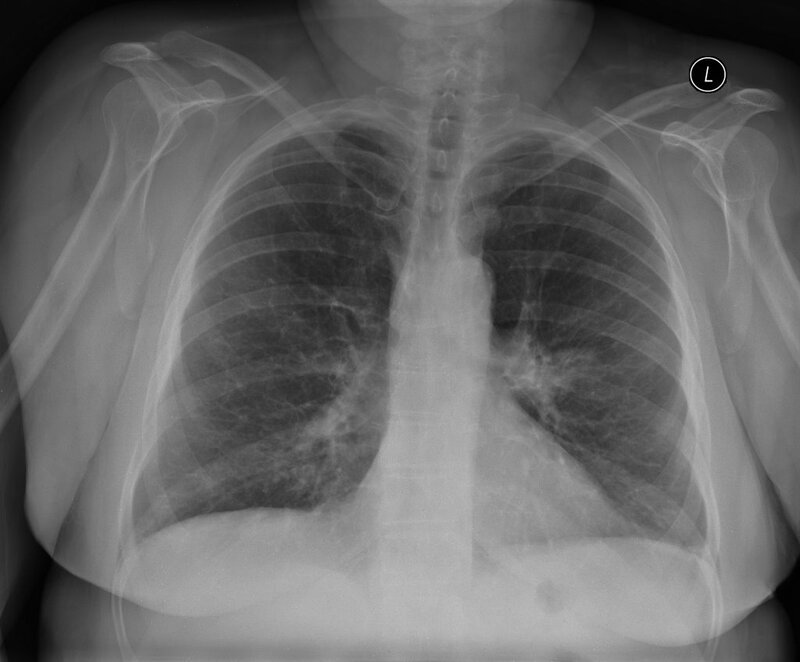 We were consulted on this 82 y/o man for an abnormal CxR. left lower lobe lesion. What would you do next? really had any cough. Denies any fever, chills, rigors, chest pain, or weight loss. Denies any hemoptysis. Denies any previous infections. Denies any headache, nausea, vomiting, or diarrhea. AST MEDICAL HISTORY: Peripheral vascular disease, hypertension, hyperlipidemia, previous history of smoking. MEDICATIONS: Atenolol, Protonix, Procardia, hydrochlorothiazide, Lipitor, TriCor, aspirin, multivitamins, and Tylenol 3. SOCIAL HISTORY: 50-pack-year smoking history, stopped 2 years ago. No ETOH or drug. No mediastinal or hilar adenopathy. Repeat CT 1 month later showed no change in size. Patient was bronched with non-diagnostic tissue. Cytology brush from left lower lobe was negative for malignant cells. Micro on BAL: 30000 CFU per ml alpha-hemolytic Streptococcus, 8000 CFU Neisseria; 9000 CFU Micrococcus; 5000 CFU Streptococcus, non-hemolytic. What would be your next step (or any other questions you have)? At ATS there was a lecture series on sarcoidosis. Does anyone know what the discussion was regarding sarcoidosis and fatigue? I seem to remember that it was a treatable manifestation of the disease, once other causes are ruled out. Can anyone elaborate? Is there ever an indication for phlebotomies for secondary PCV? I was always under the impression that the treatment is supplemental oxygen. Is there any data to support this practice? This is a 65 y/o man transferred to our hospital for CP. He was found to have an acute coronary syndrome and a lung mass. 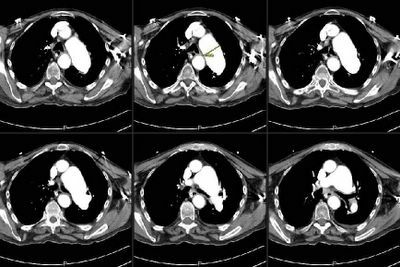 He underwent a cardiac cath ahich revealed diffuse disease: 20% LM, an occlude LAD with R-L and L-L shunt with a large patent ramus and RCA disease. In addition to his acute care he needs a CABG. 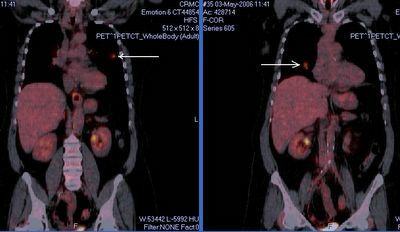 He had a stent placed in his RCA, received Plavix and ASA for a month and we stopped it so we could work up his mass. A bronch confirmed that this is a NSCLCa (squamous cell). 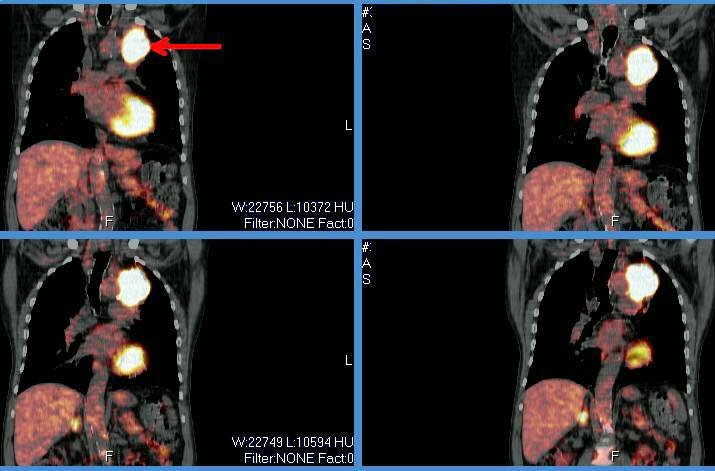 His PET scan only lit up on the mass and nowhere else. His PFTs are not great but could tolerate a lobectomy. How would time the cardiac work up and the planning of surgery for his lung Ca? 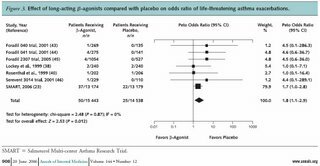 The NEJM published results from the FACTT trial on the 5/25 issue: "PAC-guided therapy did not improve survival or organ function but was associated with more complications than CVC-guided therapy." Had you been using PACs often for management of ALI/ARDS and do you think this will further change your practice? This is the woman with B/L pulmonary nodules. 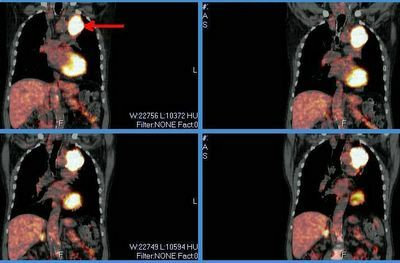 I was also concerned about these non-calcified nodules so she had a PET scan and we performed a bronch. 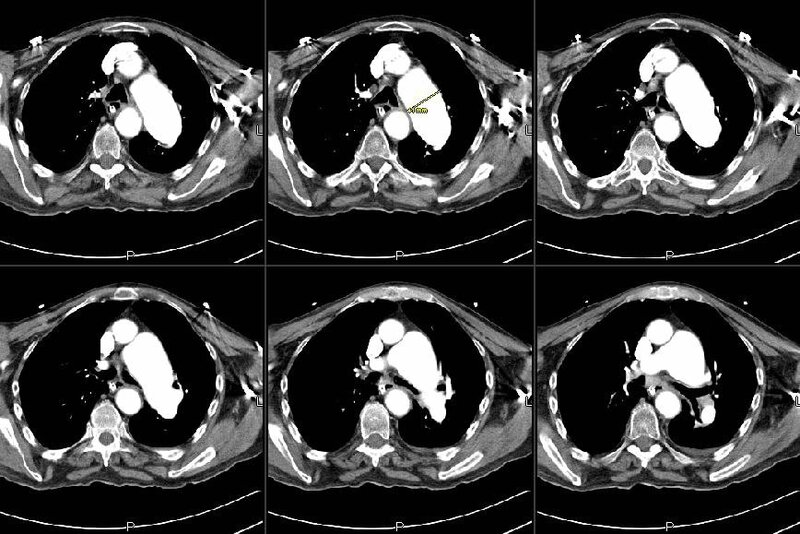 Both nodules lit up on PET and she had some faint, low-SUV uptake in the mediastinal nodes. 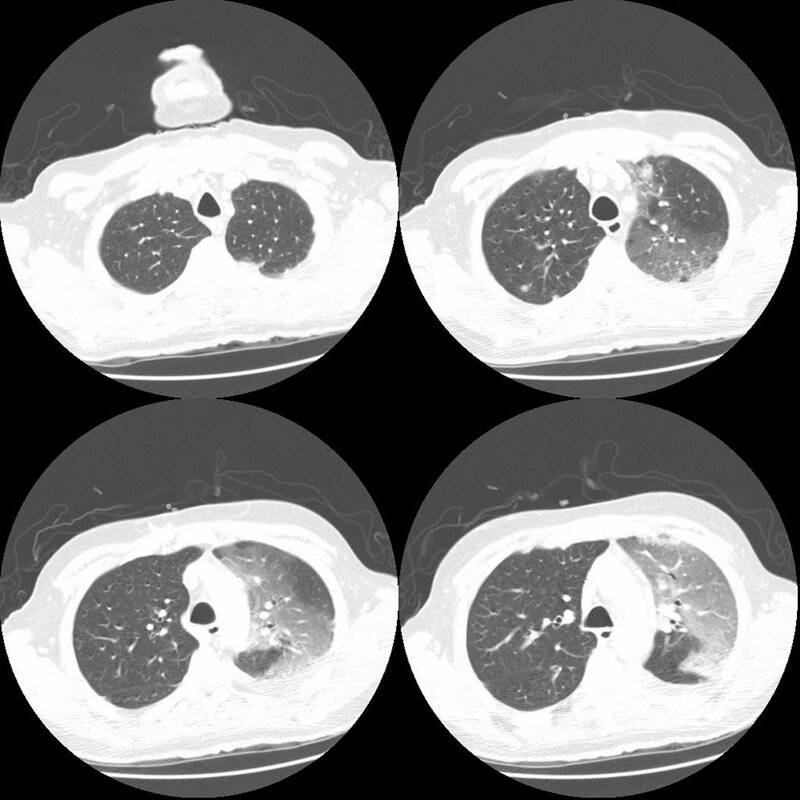 The TBBx of the R lesion were + for a non-small-cell lung Ca.